Our main barn houses six 12' by 12' box stalls, a wash rack, feed room, and tack room. There is hot and cold running water and a heated bathroom. It has solid walls, heaters and is at the center of the facility. This makes it an excellent choice for horses who love being in the center of it all! We sometimes call this barn "The Penthouse." 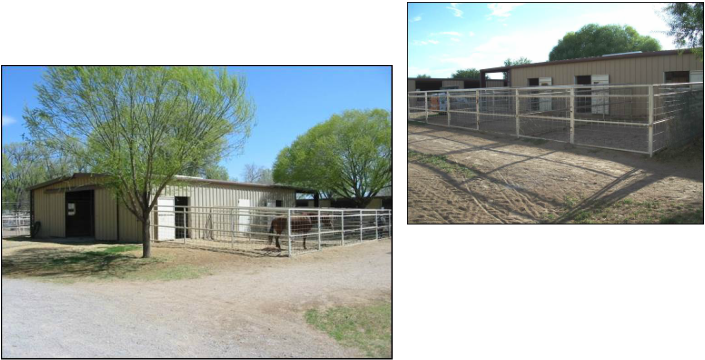 This barn was designed for mares with foals, The inside stall portion is a gigantic 11.5' by 15' with solid walls, The doors to the outside close, so they can be made into box stalls. With attached 11.5' by 24' pens, these horses enjoy the best of both worlds. These stalls are 14' by 24'. In other words, they are huge! A 14' by 12' portion is with stall mats and shavings. The remaining 14' by 12' is crusher fine rock covered with soft dirt for excellent drainage. The horses love them because they are out of the wind, large and from here they have a great view of the action. These pens, well, they are outside pens. They are 14' by 23', large enough for even the biggest warmbloods. They have soft dirt floors with excellent drainage, and shelters to keep your horse out of the elements. Horses who enjoy living out in pastures tend to enjoy these pens very much. Top Notchers enjoy a full size jumping arena with all weather footing, so we can ride every day of the year. We also have a separate ring with a dressage arena.